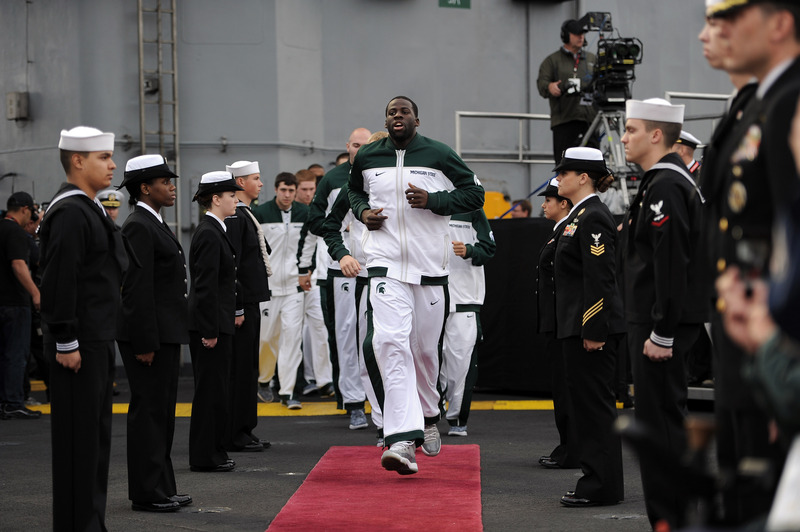 Near the beginning of the 2011-12 college hoops season, North Carolina downed Michigan State 67-55 aboard the aircraft carrier Carl Vinson in the Quicken Loans Carrier Classic. In a few days, both teams will compete for the NCAA title as No. 1 seeds — giving them much better odds at claiming a championship than you have at winning your office pool. But what about the flattop festivities for this November? With no carrier readily available in San Diego, the future looked dim. Until this report from The (Charleston, S.C.) Post and Courier, that is. According to the paper, the World War II-era carrier Yorktown, now a museum ship at Patriots Point, could host a Nov. 9 college hoops doubleheader — a women’s game between Notre Dame and Ohio State and a men’s clash between Connecticut and an opponent to be determined. Patriots Point officials and reps from the Morale Entertainment Foundation, which ran last year’s event, are working out the details, according to the report. The article doesn’t address what holding the game on a museum ship will do to the participation level of the Navy — those guys in the white hats in that picture don’t hang out aboard museum ships all that often. Without the active-duty appeal, will ESPN want to air the game? Will the title sponsor return? Will the president show up again? One organizer told the paper that more details, including an official announcement, could come early next month.